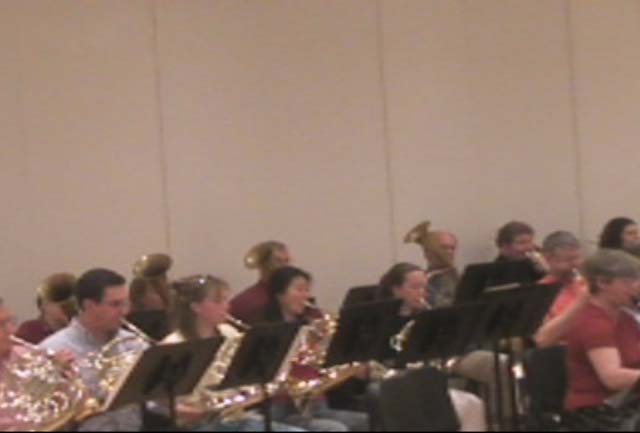 Left to right against the back wall: Helen, Marti, Bruce, and Bill on Wagner tubas, playing Bruckner's Symphony No. 7 with the Green Mountain Mahler Festival orchestra. The Wagner tuba was designed to be played by horn players, and despite the name, it is a variation of a horn, not a tuba. It has a conical bore of similar dimensions to a horn, is played with a horn mouthpiece, and has rotary valves operated by the left hand, as on a horn. Compared with a horn, the Wagner tuba is slightly wider through the throat, and has a substantially smaller bell. And the bell points up, which takes a bit of getting used to. The Wagner tuba is also more fully conical than a horn. Horns have cylindrical tuning slides, which makes for easier tuning, but is a bit of a compromise in terms of sound quality. Wagner tubas, by contrast, are conical even through the tuning slides, which we discovered when we pulled the slides to oil the valves or empty out water. One end of the tube has a slightly different diameter than the other, and the slides only fit one way. 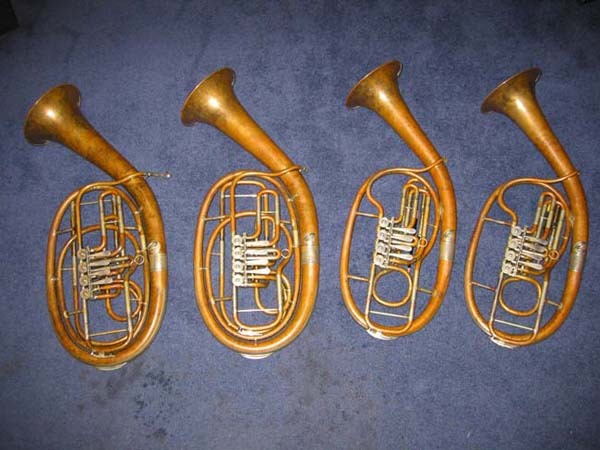 Wagner tubas traditionally come in sets of four, two bass tubas in F, with the same length and range as horn in F, and two tenor tubas that are a little smaller and pitched a fourth higher in Bb, equivalent to the Bb side of a double horn. 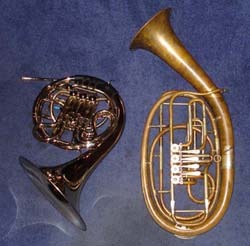 Since these are single horns, there is no thumb trigger, but instead there is a 4th valve, equivalent to 1+3, that opens up all kinds of alternate fingerings (which can help alleviate intonation problems) and fills in the notes in the extreme low range that would otherwise be missing on a single horn. How do I hold this thing? really low C B Bb A# A Ab G# G Gb F# F E Eb D# D Db C# in tune? About the best description we came up with for the Wagner tuba is that it's what the horn would be if it had been invented by Dr. Seuss. The Wagner tuba is wonderful and strange and quirky, if not downright squirrelly. It's a horn yet not-a-horn, familiar and foreign all at once. Intonation can be an adventure on the Wagner tuba, and sometimes the instrument feels a little out of control. And then there's that crazy up-in-the-air bell, projecting the sound off into space somewhere. And it sounds really cool. Really. Really. Cool. "Our" Wagner tubas, borrowed from the Boston Symphony, a beautiful set made in Germany by Kruspe. Bill thinks they were built in the 1930s. Helen and Marti played the bass tubas (the two larger ones, on the left), and Bill and Bruce played the tenor tubas (the two smaller ones, on the right). The instruments are unlacquered, and turned our hands green when we played them. They have a beautiful tone, and are decently in tune as Wagner tubas go -- which is to say, we struggled with intonation, but it wasn't nearly as bad as it could be. On April 17, 2008, we played Bruckner's 7th with the Green Mountain Mahler Festival. We had the coolest instruments in the orchestra, and acquitted ourselves nicely. The very next day, Bill drove down to Boston to return the Wagner tubas to the Boston Symphony. We kind of miss them, and wish we had our own set. Ah, well, at least we'll always have Bruckner. Previous page: We Had a Dream. We Had an Awesome Dream.